In the early part of the century a large number of members from Reading and district were introduced into the Lodge and this continued for some time. In 1903 Mrs. Lendrim was assisted with 5 Guineas and support given to her petition for Grand Lodge assistance. Considerable expansion took place in 1903 and 1904, in December 1903 there were 5 Initiations. This made 14 new members for 1903, followed by 10 new members for 1904. The town of Camberley started to really expand both by business and residential development, particularly near the Railway Station, including the High Street, Park Street, Obelisk Street, Princess Street, London Road, Park Road, Gordon Road, etc. The secretarial services of Bro. W. D. Blyth were recognised, he had to resign because of ill health. A cheque for 10 Guineas was unanimously voted. He was succeeded by Bro. R. Shepherd. During the recess of 1905 The Duke of York had changed hands and the old meeting room was now a coffee room and the meeting place had beeen transferred to the billiard room. There was no- alternative but to move to a new meeting place. The White Hart Hotel, Blackwater, provided dinner at 7/- a head. Champagne 8/-. Hock 3/6d. Burgundy 4/-. Claret 3/6d. Scotch 4/6d. Irish 4/-. Syphons 8d. and Cigars 4d. To avoid boring readers with the inevitable stories of Initiations, Passings, Raisings, Installations, etc., and the foundations of the Lodge being well and truly laid during the first 30 years, a slight departure from the history is now inevitable. After 30 years service Bro. I. Paine, Tyler, resigned and Charles Parrant was elected in his place. The final meeting was held at the Cambridge Hotel and from October 27th, 1909 meetings were held at the Municipal Buildings, London Road, Camberley. A vote of condolence was passed on May 25th, 1910 on the death of King Edward VII. W.Bro. Twort appointed to Grand Lodge and on 28th May, 1913 he was presented by the Lodge with his Grand Lodge Regalia of A.G.D.C. He returned the honour by presenting the Lodge with a framed portrait of himself in Grand Lodge Regalia. Among the little personal bonuses I enjoyed whilst reading these minutes was to see that my wife’s grandfather, W.Bro. G. F. Drowley, reigning Master of Bisley Lodge, attended as a guest at the installation meeting on January 28th, 1914. During the 1914 – 18 war the Lodge continued to thrive, albeit under war time conditions, but despite slight problems at The Municipal Buildings, meetings continued there. The finances of the Lodge mounted and £75 was deposited at the bank, 10 Guineas was donated to the Freemason’s War Hospital and 50 Guineas to the Royal Masonic Institution for Boys and 30 Guineas to the Royal Masonic Institution for Girls. Bro. George Compton did not forget his raising ceremony; he started this ceremony on April 28th, 1915. He was called away because his business premises at 41 London Road were on fire and his raising was continued on May 26th, 1915. Regrettably Bro. G. Compton was killed in action in 1918. The Bi-Centenary of The Grand Lodge of Engand was celebrated on June 23rd, 1917. Duly recorded in the minutes. The end of the war saw a further expansion; Camberley in particular growing again and in 1920 the Audit Committee expressed their gratitude for the excellent financial position of the Lodge. Fifty guineas was donated to the Masonic Million Memorial Fund. A box for the working tools, complete with inscribed brass plate in memory of Bro. G. Cornpton was acquired and duly dedicated. Later a new. set of working tools was purchased to complete the memorial to Bro. Compton. Capt. R. A. Hill was installed as W.M. 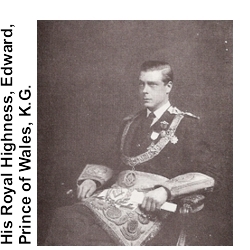 on January 31st, 1923; his reign was shortened due to some personal problems, details of which were suppressed by influential members of the Lodge. W.Bro. Hill tried to rejoin the Lodge in September 1923, but his resignation was unanimously agreed should stand. At the September meeting 1923, Bro. P. W. White was presented with a commemorative medal in connection with his own personal efforts on behalf of the Masonic Million Memorial Fund. Bro. E. H. Foster, Junior Warden, was elected Master Elect and at his installation supper in 1924 W.Bro. Twort’s family provided singing and musical entertainment. In April 1924 it is interesting to note that Bro. Hill asked for assistance and a petition was granted and resulted in £100 being authorised by Grand Lodge. During this month the Lodge made a donation of 20 guineas per annum for 4 years to become a Founding Lodge of the Freemason’s War Hospital. In November 1924 W.Bro. Twort was presented with a Bronze Gilt 8 day clock to celebrate his Golden Wedding Anniversary; 45 years as a member and a total of 30 years service as Treasurer. W.Bro. P. W. White installed as W.M. in January 1925; in April he proposed that a site should be found to build a Masonic Temple. At the September 30th, 1925 meeting W.Bro. Hedges proposed the recommendation authorising the W.M. and Wardens to sign the petition for a new Lodge, as a result of this Bagshot Lodge 4804 was duly formed. The proposition was carried unanimously. Our one and only daughter Lodge during the 100 years. Reading histories of other Surrey Lodges formed in the mid-19th Century, particularly those associated with small towns, there appears a certain amount of conservative reticence in the formation of new lodges and quite a number of times petitions were defeated. Our experience of this attitude was in 1934 when a petition was defeated 24-15. However, our daughter Lodge, Bagshot, had other ideas and Camberley Lodge 5591 was formed in 1935, creating quite an interesting and ironical situation. In 1926 H.R.H. The Prince of Wales became P.G.M. of Surrey and subsequently H.R.H. consented to be an honorary member of the Lodge in 1927. This news was received with acclamation, as it also coincided with our Golden Jubilee. Our Golden Jubilee was celebrated on October 26th, 1927 with a Masonic Service at St. Michael’s Church at 3.0 p.m., tea in Central Hall at 5.15 p.m., and dinner at the Municipal Buildings at 7.15 p.m. Over 90 brethren attended these celebrations and included the interesting event of 4 Lewises carrying the volume of the Sacred Law in the Church Service. They were sons of W.Bro. P. W. White, A. T. C. Lunn and Brothers J. A. Andrews and G. J. SmalIbone. This event was commemorated on their behalf with a presentation to each of a suitably inscribed Bible, accepted by their fathers. The Secretary read a short history of the Lodge. Unfortunately there is no trace of this being recorded. Kind actions were continued in the financial assistance to widows, Mrs. Blackaby being helped with her mortgage and rates. Also a proposition carried unanimously, that currently and in future that P.G.L. regalia should be presented to those members so honoured. Further actions to celebrate the first 50 years included the restoration of Lodge furniture, a complete new set of officer’s collars, a new carpet and a Lodge Crest. Jubilee medals for the W.M. Wardens, Treasurer and Secretary.